At Sony Pictures “A Greener World” even The Wheel Is Green…..
Mar - 27 | By: Green Production | no comments. 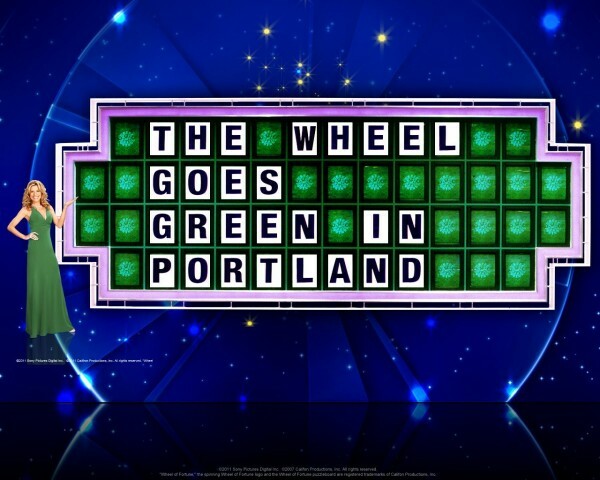 We have already blogged about the Wheel of Fortune shooting a week’s worth of shows this week end and early next in Portland for their up-coming “green week” but I also wanted to take the opportunity to give a shout out to Sony Pictures Entertainment and their sustainability efforts. Like other studios, Sony Pictures has in place it’s best practices and green policies; such as their “Road to Zero” (zero waste) and “A Greener World” vision, on set, in studio offices, stages and across all corporate operations. Additionally, they encourage green messaging across their productions. For example, Wheel of Fortune highlights a five day “eco-themed” show every year. Last year they highlighted the Chevy Volt – this year we will have to wait and see what they bring focus to. A few weeks ago I blogged about Habitat For Humanity’s ReStore outlet and interestingly Sony Pictures is one of the top suppliers of many goods and materials to Habitat for Humanity. They donated over a thousand tons of set material and props that were then used in the construction of new homes or sold in one of Habitat’s home improvement stores. The studio averages a full tractor trailer of material per week. Pretty impressive! Additionally the studio requires a legacy project in the community for each feature film production they produce. Portland (shooting at the Oregon Convention Center) is the backdrop for the Wheel’s green week this year . Vanna has already been in Portland, out and about and around town shooting the greener aspects of the city when they came up last year. For fans of the show and if you are interested in showing your (green) support, come to Washington Square this Wednesday (March 28th) between 2-6PM and trade in your old electronics for a chance to win VIP tickets to the up-coming show tapings on March 30, 31st, April 2nd and 3rd. Sony, IMS Electronics Recycling and KATU are sponsoring this event. For information on exact location and what you can recycle see here. The Portland green week is set to air May 7th-11th – we can’t wait!